Going into Four Continents, the big questions were: Would Duhamel/Radford continue their dominant march toward Worlds? And would Pang/Tong still be competitive after a year off (and at the age of 35)? The answer to both questions turned out to be yes. 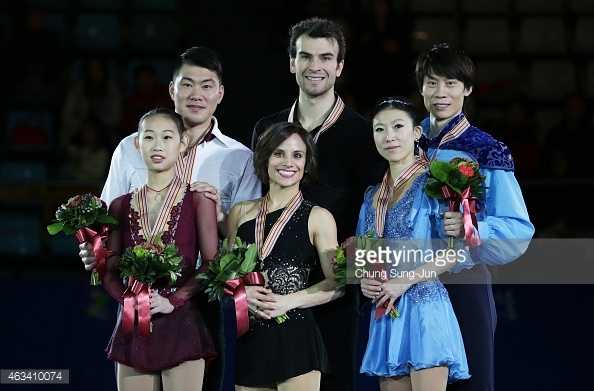 Duhamel/Radford won again in Seoul, and Pang/Tong proved they do indeed still have it. 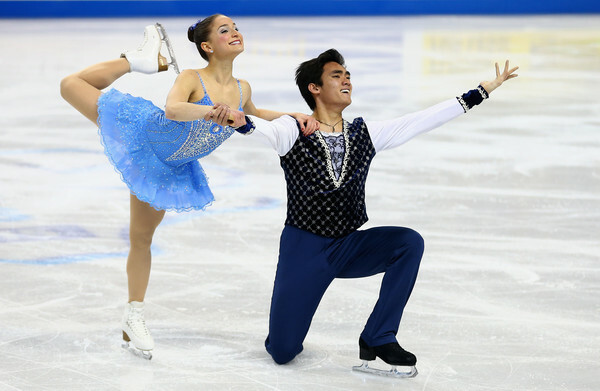 Along the way, we saw some great performances by other North American and Asian pairs. Meagan/Eric have had a dream season this year. They’ve won every event they entered and done so in style. They started the competition here with another great short program. Their level 3 triple twist had nice height and earned +2s and +3s. Their SBS 3 Lutzes were well landed and the SBS spins excellent. Every element earned positive GOE. One thing I noticed: Meagan/Eric really have the pacing of this program down. Everything happens at just the right moment. Nothing feels either slow or rushed; they just look so comfortable. Meagan/Eric earned 75.67, a new season’s best score. Their Muse long program was a bit more of a struggle. Meagan put her hand down and stumbled on the SBS 3Lz, and Eric’s landing was off, too. This has been such a consistent element for them all season that it was surprising to see this mistake. Next up was the throw 4S; Meagan landed it but with a hand down again. At this point I was worried, but Meagan/Eric dug in and regrouped with great SBS spins and a successful SBS 3T/2T/2T combo. The throw 3Lz toward the end was strong. Their performance level fell off a bit after the early mistakes, though; they didn’t have quite their usual spark and energy. “That was one of the hardest longs . . . .” Meagan said as they came off the ice, and Eric tweeted later that he hadn’t felt well going into the LP. Even though it wasn’t D/R’s best, it was a still a good program. They scored 143.81 points, several points off their season’s-best mark at the GP Final–but still 10 points ahead of the other 4CCs pairs, and higher than any other pair has scored all season. (Stolbova/Klimov came close with 142.88 at Rostelecom.) So, even though 4CCs wasn’t their best competition, I don’t think it hurt their overall momentum. They will still go into Worlds as the clear favorites. 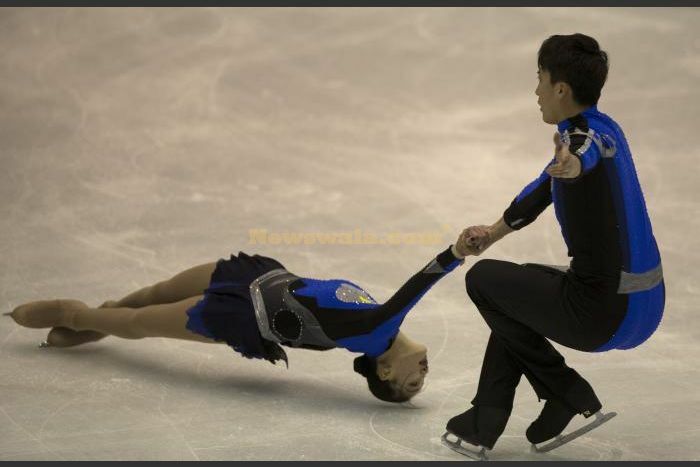 Cheng Peng and her partner, Hao Zhang, rebounded from a disppointing finish at the GP Final to win the silver medal here. Peng/Zhang’s Arabian Dance SP was gorgeous. They had great speed going into their opening SBS 3T and landed the jumps very well. Their level 3 triple twist was amazing—it just sailed through the air, with tremendous height, getting all +2s and +3s. The thow 3Lp was also terrific. The only error was a slight synchro loss on the SBS spins. Even better than the elements, though, was the perfomance itself. It was hypnotic, intriguing, unique. Basically, everything you want pairs skating to be. I love the mystery and intensity of this program. They scored 69.81, a new season’s-best. I would have liked to see their PCS marks a bit higher, especially in CH and IN. They were 1.5 points behind D/R in PCS. P/Z’s long program was not quite as strong as their SP. They opened with a level 3 quad twist, which was simply amazing. They earned 10.67 points; it was the highest-scoring element in the whole event. However, Peng then fell on the very next element, the SBS 2A, which broke the spell cast by their incredible opening. She also landed forward on the SBS 3T and singled the 2T. The rest of the program was very good, though. The throw 3Lp and throw 3S were both exceptionally well done, with great height and distance. The lifts were good and earned almost all positive GOE. Peng also had a beautiful position in the level 3 death spiral. It all added up to another season’s-best score of 131.64. This long program to Shostakovich’s Allegretto hasn’t been universally embraced by skating fans. However, I personally find it fascinating. The music is odd, ominous, and intense, and the choreography matches it perfectly. P/Z have yet to skate the program clean this season, and, as I said in a previous post, the precision and delicacy of the music demands clean skating to have its full impact. If P/Z do manage to go clean with it at Worlds . . . Well, not only will I end the season as a happy pairs skating fan :-), I do believe they can reach the podium (if not the top step). This was Pang/Tong’s first competition since Sochi. No one had expected a comeback, especially since both are now 35. Some rust showed in Pang/Tong’s tango short program to Oblivion/A Los Amigos. Tong put both hands down on the opening SBS 3Ts, and their SBS spins were off. The rest of the program went pretty well. Their triple twist was very high and lateral and got great GOE. The footwork was interesting and had flair, although it could have been faster. I enjoyed the tango program; I think it’s a good package for them. We’ve seen a lot of tangos the last few years, and this program doesn’t break any new ground. But it works well on its own terms. They scored 66.87 to place 4th in the short. Pang/Tong then came out and skated their Ci Saro long program as if they had never been off competitive ice. Pang singled the opening SBS 2A and doubled the SBS 3T. However, they simply moved on as if these mistakes never happened, and the rest of the program was vintage Pang/Tong. The triple twist was again well done. The two throw jumps were excellent, both with great distance. The SBS spins were well synchronized. Everything was up to their usual standard (except for the pairs combo spin–a bit slow). They had positive GOE on every element except the SBS jumps, and their PCS was slightly higher than Duhamel/Radford’s. 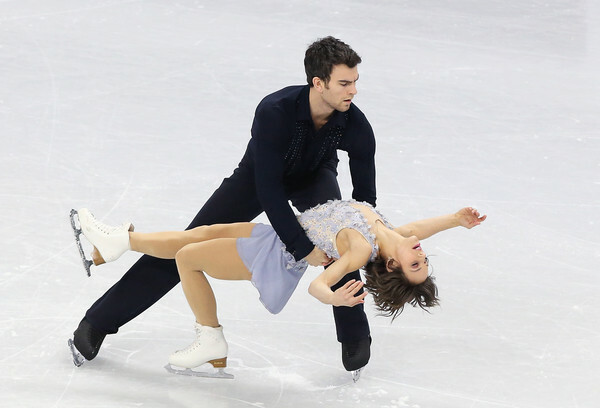 Their long program is lyrical, romantic, and emotional—very much their typical style. Pang/Tong have done so many programs in this vein that you’d think it would get boring. Yet for me it never does, because they skate with so much conviction and sincerity that it doesn’t feel jaded. Pang/Tong scored 133.12 for second in the LP and third overall. Why did P/T come out of their (unofficial) retirement? Publicly, all that’s been said is they want to skate one more time for a home audience at Worlds. But I have to wonder if the Chinese federation asked them to come back to stack the odds in favor of a pairs medal at their home Worlds (very likely a matter of national pride for the federation). If so, Pang/Tong demonstrated that the federation’s trust is not misplaced with their bronze here. Pang/Tong’s return has not been met with universal acclaim, because fans of Yu/Jin are disappointed to see Y/J off the Chinese team in favor of Pang/Tong. 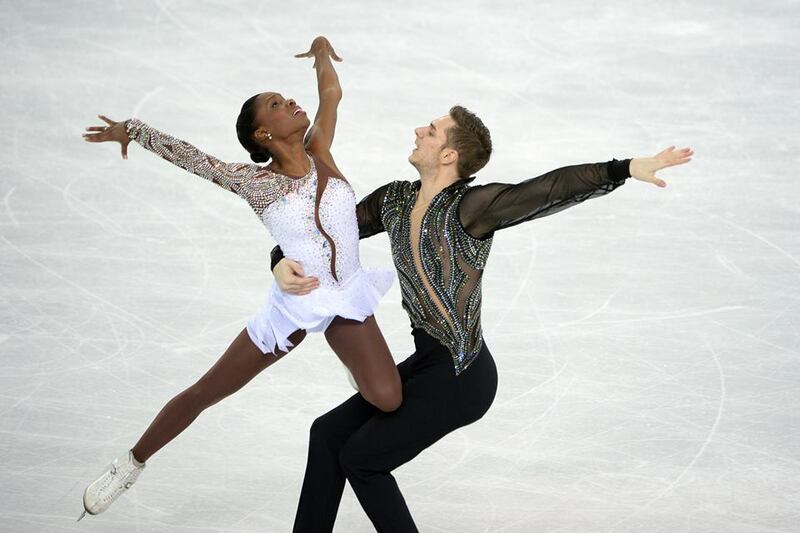 However, the scores at Four Continents do tend to validate the federation’s decision. P/T got great PCS, an indication the judges still see them as a top pair. Their TES scores were lower than Peng/Zhang and Sui/Han—but comparable to, or higher than, what Yu/Jin earned on the Grand Prix and at Winter Universiade. As much as some will miss seeing Y/J at Worlds, the results here indicate that P/T are a stronger medal threat in Shanghai. 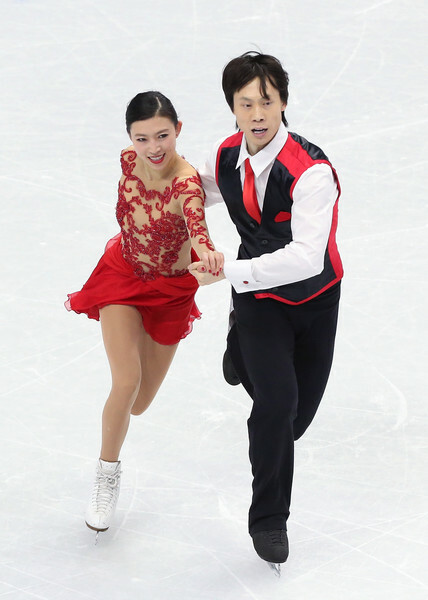 At the Grand Prix Final, Sui/Han claimed the bronze over teammates Peng/Zhang. Here, they placed just out of the medals in 4th. Sui/Han’s Stray Cat Strut SP was studded with some absolutely showstopping elements. Their throw 3F was super-high and earned almost 2 points in positive GOE. Then came their level 4 ‘Tano triple twist, again spectacularly high. Their footwork sequence was also very good and effective with the music and gained many +2s. This program is fun without being overly cutesy, and it’s a nice break from the more serious dramatic programs most of the other pairs are doing. (Remember, judges like to be entertained, too!) I actually thought Wenjing and Cong could have performed it with a bit more zing—they looked slightly nervous—but it still was excellent and earned a season’s best 69.19. They were third in the short. 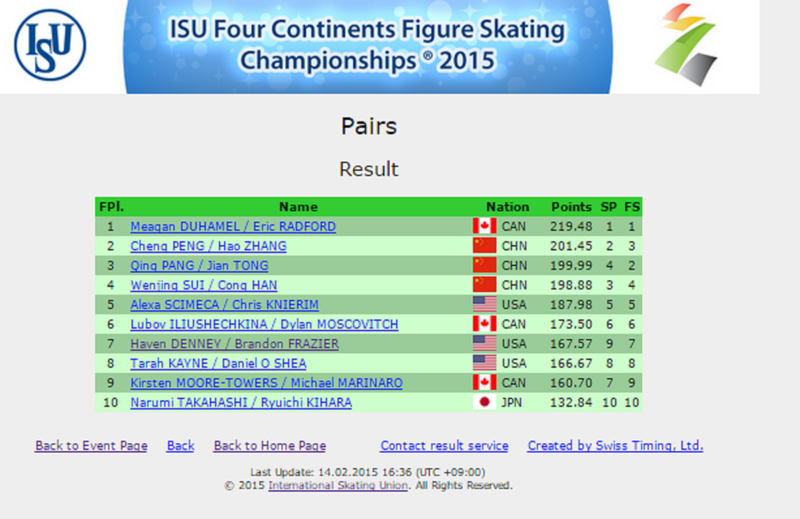 In the long program, Sui/Han fell to 4th mostly because they received no points for their pairs combo spin. The rest of the program was good. They opened with a stunning level 3 quad twist, which earned 10.10 points. Their throw 3F was again amazing, earning almost straight +3s. Wenjing two-footed the landing of the throw 3S, but the lifts and SBS spins were very good. I felt their interpretation of the Francesca da Rimini program was fine, but not quite as expressive as at TEB earlier this season. Their TEB LP score remains their season’s best. This was Alexa & Chris’s first competition as U.S. champions. They delivered two good performances here to place fifth. S/K opened their Tango de Roxanne SP with a very nice level 3 triple twist. The only mistake was Chris doubling the SBS 3S, which cost them a couple points. However, the other elements were very good and earned almost all positive GOE. Their throw 3F was a little tilted in the air, but Alexa still landed it well. They looked strong and secure throughout and earned a season’s-best 63.54. S/K started their long program with their big new element: the quad twist. This attempt was not as good as their Nationals quad twist. The catch was a bit low and crashy, and they got some negative GOE. The total score for their level 2 quad twist was 6.89, actually half a point lower than the 7.40 they earned in the SP for their level 3 triple twist. (Nonetheless, I still think going for the quad is worth the risk. Although they lose a bit if they don’t do it well, they stand to gain up to 3 pts if they can excecute it as well as the Chinese teams.) After the quad twist, Chris doubled the SBS 3S again. However, they completed the following SBS 2A/2A sequence, albeit slightly out of sync, and the program got stronger from there. Both throw jumps were very good, with great height and many +2s. Their lifts were also first-rate, with great speed and ice coverage. Chris’s lifting skills are quite underrated, in my opinion. He makes difficult lifts look very easy—just what you want in a male partner. S/K closed the program with a lovely death spiral. I enjoyed their interpretation of An American in Paris; I thought they skated with a little more freedom than at Nationals. Alexa/Chris have such a great look together on the ice: They skate big and really fill out the ice with their movement. They scored a new season’s-best of 124.44 to place 5th in the long and overall. Alexa/Chris have improved so much this season. They’ve added the quad twist, their throw jump consistency has improved, and they’re getting more confident in their presentation. It is very clear that the international judges really respect their elements and them as a team. Their total score here of 187.98 left them in an interesting place: About 10 points behind the top 4 teams—who were clearly a class above–but over 14 points ahead of all the lower-ranked teams. This indicates they’re making real progress toward that top tier. I think they’re in a great spot heading into Worlds. What a moment for Luba Ilyushechkina: Her return to major international competition after 4 long years away. (Frankly, an eternity for a competitive skater.) And what a moment for Dylan Moscovitch, too: His return to international competition with a new partner who is reinvigorating his already accomplished career. It’s an incredible story. Luba/Dylan had a very nice performance in the short program. Luba slightly two-footed the opening SBS 3S, but the GOE damage wasn’t too bad, only about half a point off base value. Their triple twist—their weakest element, currently—was a little higher than usual but a bit crashy on the catch. They recovered with a very fine throw 3Lz, lovely level 4 death spiral, and a strong press lift. Their Feeling Good SP is probably my favorite short program of the season, and they performed it with great ease and conviction. Wonderful to see. Their score was 60.13. This season, we’ve seen how hard it is for new pairs to make it cleanly through a 4-minute long program. There are just so many different skills and transitions to perform in an LP, at a time when you’re still coming together as a team. Like most of the other new pairs this season, Luba/Dylan are often a bit stronger in the SP than the LP. But I thought they showed great fight, grit, and determination in the LP here. They landed both SBS jump sets cleanly. The triple twist was a struggle, with Luba landing on Dylan’s shoulder, but they had nice speed going in and out. Luba’s landing on the throw 3Lz was scratchy, but she held on. Despite the technical flaws, I was completely absorbed by their performance, enjoying every moment. There are just so many beautiful and interesting moves and transitions in their long program. I love the intent and the meaningfulness of what they’re putting out there. Their programs feel so organic and true to them. Out of all the programs in this event, it was theirs that I wanted to re-watch again, immediately. Their PCS marks are not as high as they should be—but it’s sort of beside the point, right now. The PCS is not high because they’re new and they have no reputation, but I’m not worried, because I know it will come next season. The quality of what they’re putting out there is undeniable. And . . . speaking of undeniable. Is there anyone who could fail to appreciate the beauty and fire of Luba Ilyushechkina’s skating? There are certain things she does—simple things—that send chills down my spine. Her position in their camel spins. Her death spiral. The placement of her hands. At the risk of descending into total uberdom, I’m just going to say it: Watch out, world. Watch out, top pairs. Because this girl wants it. There is a fire in her eyes. You can see it. And her talent is incredible. Who knows what the future will bring, but the future could be very, very bright for this pair. I truly hope it is. Unfortunately this was a somewhat disappointing event for Denney/Frazier. They had mistakes in both programs to finish 7th. Their Godfather SP started off well with a very good level 4 triple twist. The throw 3Lp had good distance, although Haven’s landing was a bit stiff. However, Brandon then fell on the SBS 3S and caught an edge slightly going into the SBS spins. The death spiral was also a bit slow. I thought they skated the program with a lot more smoothness and attack than at Nationals, but there were just a few too many mistakes. It’s too bad, because I love the interesting details and choreography of this program. I’d love to see it skated really cleanly; I think it would score well. Haven/Brandon earned 56.98 to place 9th in the short. D/F’s long program was improved, but still not their best. Their level 4 triple twist was even better than in the SP—very high, very good. Their twist just keeps getting stronger and stronger. (In fact, I’m almost beginning to wonder if they could do the quad twist. Not many teams can even aspire to that, and I’m not sure if it’s in the cards for D/F, but I wonder.) The throw 3Lp was very good, as was the throw 3S. However, unfortunately, Haven fell on the SBS 3S and they both singled the first set of 2As. Really too bad. 😦 The other elements were good, especially the lifts. They scored 110.59 and moved up 2 spots in the LP to place 7th overall. However, it was still well off their season’s-best and they looked quite disappointed afterward. Tarah/Danny came in as defending silver medalists at this event, so I’m sure they were disappointed to place only 8th. But of course, the field this year was far, far stronger than last year, and they are still in the process of coming back from Tarah’s injury. I really enjoyed their Your Song short program. The sensitive, uplifting music really highlights their strength as performers. Tarah/Danny just have an instinctive musicality, an ability to catch the highlights and emotions of music and make you feel them, too. Technically, their program was fine for the most part. The twist was only level 1 and got some negative GOE. They lacked speed going into the throw 3Lp, and the dismount from the lift could have been steadier. Their GOE was again mostly flat; not many positive marks. But the program was very enjoyable. They earned 57.91 for 8th place. Tarah/Danny appeared a little tight in their Spartacus LP. They didn’t have quite the same sparkle and animation as at Nationals. Their opening triple twist was not the best; Tarah was almost on the ice by the time Danny caught her. (GOE marks for the element were rather inexplicable, ranging from -3 to +1). They landed both SBS jump sets cleanly—nice to see! However, they looked tentative going into the throw 3Lp, and Tarah fell. The throw 3S was landed but small. They scored 108.76 to place 8th in the LP and overall. They seemed disappointed, but I’m sure next season will be better. I look forward to seeing them on the Grand Prix next year. Kirsten/Mike were coming off a fourth-place finish at Canadian Nationals. Their Cell Block Tango SP was entertaining. This program suits Kirsten’s style perfectly, and she really performs it well. They skated with nice attack and energy. Their elements were pretty good except for the triple twist, which was crashy and got negative GOE. They scored 59.30 to place 7th in the short. Kirsten/Mike’s Chess LP was not as successful. They landed the SBS jumps, but Kirsten fell on the throw 3Lp. The biggest problem was the lifts, however. On the first lasso lift entrance, Kirsten got stuck on Mike’s shoulders, and he had to heave her up from there. They continued with the lift but it received no points, no doubt due to the botched entry. The second lift was slow. The entry to the third lift was also labored, and it got almost all negative GOE. They scored 101.40 and dropped 2 spots to place 9th overall. I hope lift technique will be a big focus for Kirsten/Mike in the offseason. Narumi/Ryuichi placed last in both segments of this event. Their Bossa Nova Baby SP was not bad. However, Narumi fell on the opening SBS 3S. They again performed only a double twist. Narumi/Ryuichi’s LP was one of the better performances I’ve seen from them. Narumi again fell on the SBS 3S, but landed the SBS 2A. She also landed both throw jumps nicely. Ryuichi looked more confident with the lifts here than at Japanese Nationals (where he was recovering from a hand injury). Their SBS spins were good. I thought they performed the program quite well, with a little more smoothness and energy than usual. However, they scored only 87.21. This was a season’s best but still 14+ points behind MT/M. I think their lack of speed, size, and presence on the ice is holding back their PCS scores–perhaps a bit unfairly at times, especially considering they only had one mistake in this program. Ryuichi was not happy with the scores in the kiss-n-cry, and I can’t say I blame him. I really enjoyed this pairs event at Four Continents! The top pairs all skated really well, and there were some great moments from the lower-ranked pairs, too. 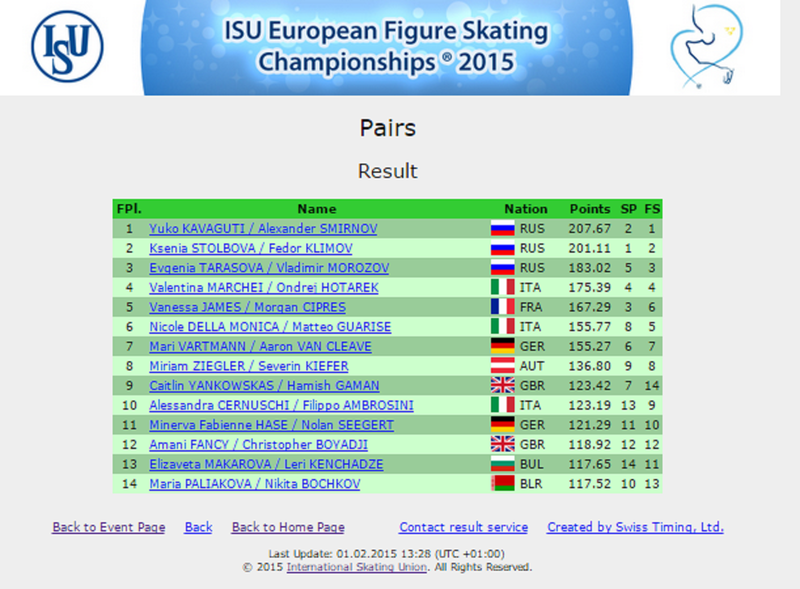 Although there were fewer pairs at 4CCs than at Europeans, I thought the overall quality was definitely higher. At the risk of providing too much pairs coverage, I wanted to do a quick review of the pairs event at Winter Universiade last weekend. There were only 6 pairs in this competition, but 4 were high-level teams. The event was held in a small but cheerful, brightly lit arena in Granada, Spain. (No doubt a nice place for the skaters to visit this time of year!) Since this is a fairly low-profile event, many of the skaters’ primary coaches did not travel to the competition. Here’s a brief look at what happened. It was an easy victory in Granada for XiaoyuYu and her partner Yang Jin. They dominated the event, winning by 7 points. Their Yulunga Spirit Dance short program was very good. They landed a huge throw 3Lp, a high triple twist, and good SBS 3Ts. Their speed could have been just a tad better, but they skated very well and scored a season’s best 64.75. Technically, Yu/Jin’s LP was not one of their best. The program started with Xiaoyu falling on the SBS 3T. This surprised me–it was the first time Yu/Jin have fallen on their SBS jumps all season! 😦 They recovered with a strong SBS 2A/2A sequence and a solid level 3 triple twist. All three lifts were gorgeous, with fast rotation and beautiful positions by Xiaoyu. There were some flaws in the other elements, however. The throw 3Lp was huge but 2-footed; the throw 3F was landed very low. Also, the pairs combo spin was a bit slow and got some negative GOE. Despite the slight technical errors, however, their Humility and Love LP was still beautiful to watch. I feel like their chemistry and interpretation of this stunning program continues to grow. Artistically, I found them a level above all the other pairs here. Unfortunately, it looks like this may have been the final event of the season for Yu/Jin. With the recently announced return of Pang/Tong, Y/J are now relegated to the #4 spot in China and are presumably off the World team. 😦 The only way I can see this changing is if one of the other Chinese teams has an injury or a complete meltdown at 4CCs. Barring that, we will probably not see Y/J again until next fall. It’s sad to think of this team missing Worlds, especially in their home country, when they’ve been so good this season and even made the GP Final. Kristina/Alexei continued their impressive debut season by winning silver here with two solid performances. A/R opened their Nine SP with a strong set of SBS 3S. Most of their elements were fine except for the SBS spins, which were a bit out of sync and slow in the camel section. They placed second in the short. Their Master & Margarita LP started off well with a SBS 3T/2T/2T combo. They also landed another nice set of SBS 3S, well synchronized for such a new team. A/R’s triple twist was level 3 but crashy and low, especially compared to Yu/Jin’s high, smooth twist. The throws were also small in comparison and had landing flaws. As yet, lifts are not a strong point for A/R. Alexei’s footwork is a bit slow, the lifts lack speed, and ice coverage is not the best. Fortunately, Kristina is quite flexible and hits some very nice positions. Her swan position, in particular, is lovely. Kristina/Alexei are good competitors and complete a lot of elements. However, the quality of the elements is not that high, and their GOE is correspondingly low. Their programs in Granada fell a bit flat, especially in comparison to Yu/Jin’s lightness and flow. A/R looked somewhat heavy and earthbound in comparison. Their programs are ambitious, but perhaps overly busy. They had only the fourth-best PCS in the long program. It was another up-and-down event for James/Cipres, but they did win bronze. I think this team is looking better now that they’re back in France with a new coach. The highlight of their Tango de Roxanne SP was a nice set of SBS 3Ts. The other elements were just okay. They were slow going into the throw 3F, and the landing was two-footed. The lift was a bit slow. Their footwork also needed more energy and got only level 2. They placed fourth, and Vanessa shook her head at the scores in the kiss-n-cry. Vanessa/Morgan started their Angels & Demons LP promisingly, with their best triple twist of the season. Vanessa had good height, Morgan got his arms down for the extra feature, and they earned level 3 on this element for the first time since Nebelhorn. The following SBS 3T/2T/2T combo was also good. However, then things unraveled again. The SBS 3S was underrotated with negative GOE, the death spiral just level 1, and the combo spin slow. Vanessa fell on the throw 3S, costing them another 2 points. Once again, the last two lifts were labored and received negative GOE. It was another disappointing LP. I hope James/Cipres can get more consistent by Worlds. Their improvement with the triple twist here was encouraging. They also have great charisma and audience appeal. This event was a missed opportunity for Vera/Andrei. They placed third in the SP, had second-best PCS marks in both segments, and were easily within reach of bronze. However, it slipped away when they had to abort the first lift in their LP. Too bad. B/D started with a pretty good short program. The highlight was an excellent throw 3Lp, earning several +2s in GOE. The death spiral was also good, with a lovely position from Vera. The SBS spins were off sync and Vera two-footed the SBS 3T, but their My Way SP still left a good impression overall. Vera/Andrei are such an elegant and attractive team on the ice; they are really quite beautiful at times. Their Adios Nonino LP was rather messy. Both SBS jumps and the throw 3F had slight errors and got negative GOE. On the plus side, they performed a nice level 3 triple twist. The real problems came with the first Axel lasso lift. They lost balance as Vera went up, she came down after just 1 rotation or so, and the lift did not count. This mistake cost them a minimum of 6 points and any chance of bronze. Perhaps rattled by this error, Andrei looked hesitant on the next 2 lifts as well. They scored 104.79 and placed 4th in the LP and overall. This was likely the final event of the season for Bazarova/Deputat. I think it was a moderately successful season for them, all things considered. 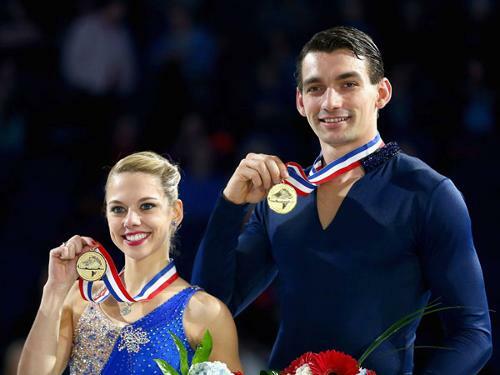 They won bronze at Lombardia Trophy and placed 4th here and at their two GP events. They took fifth at Russian Nationals. Arguably, they could have hoped to place one spot higher at some of their events. However, all in all, it was a decent debut season. The good news is that the judges clearly like their style, programs, and general look on the ice. All season, their PCS has been quite good and not too far off from the medal-winning teams. The question is: Can they push their technical elements up a notch by next season? Vera is staying vertical on the SBS jumps more often now, but there are still many two-foot landings and stumbles. The throw jumps and the twist are looking not bad. I think lifts should be a key focus during the offseason. This year, they went with a strategy of putting all three lifts in the last minute or so of their LP, and I don’t think it paid off. Their lifts have been okay, but not good enough to make a truly strong final impression with the judges. Plus, I feel that at times, Andrei has struggled physically with doing 3 lifts in a row. I think they should change their lift layout in the LP and work on improving their lift quality to help compensate for their SBS jumps (which will probably never get positive GOE). I really like this team together, so I hope they make good progress over the offseason. 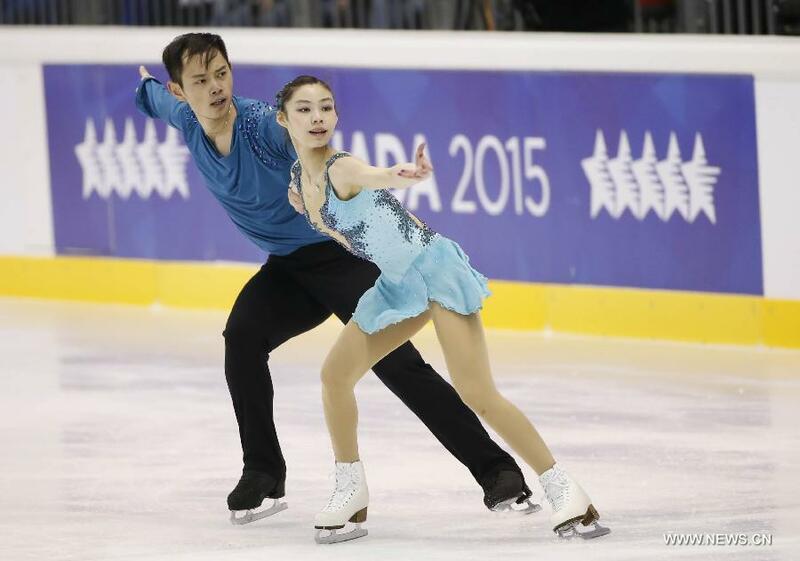 Wang/Zhang have competed the last 2 years at 4CCs and also at Cup of China in 2012. However, they are definitely a tier below the top-ranked Chinese teams. They landed some good elements in their SP, especially the throw 3Lp, which was big and received all +2s. Their lift was also good. However, their skating skills seemed weak, the transitions awkward, and the footwork slow. Wenting’s posture needs improvement, and their costumes looked like something out of a bad ’80s sci-fi movie. W/Z’s long program was pretty much a mess. There were big errors on both SBS jumps and the throw 3F. The throw 3Lp and triple twist were fine. But the modern, avant-garde choreography toward the end of the program was completely beyond their skill level. Also, their final lift did not even get off the ice. For a moment, it seemed like they might actually stop the program. Eventually they did get into their final SBS spins, but finished way behind the music. I was a little shocked by their performance because I’ve been so impressed with the general preparation level and consistency of the other Chinese pairs this season. Wenting, in particular, seemed lethargic and expressionless during the LP, as if she didn’t want to be there. (Who knows, maybe she didn’t!) There’s also zero chemistry between them. They scored 82.81 in the LP and held onto 5th place, which I found somewhat questionable. This pair from Belarus was coming off a 14th-place showing at Europeans. Their Corpse Bride SP was not bad, but minor errors pulled their score down. Their SBS 3Ts were underrotated, and their step sequence lacked speed and got level 2. Not crazy about Maria’s SP costume. (Am I the only one who finds garter belts iffy for a competitive program?) They scored 49.62 and placed last in the short. Unfortunately, there were a lot of mistakes in P/B’s Cell Block Tango LP. He turned out of the SBS 3T, she fell on the SBS 3S and throw 3Lp, and the throw 3S was two-footed. However, perhaps the biggest issue is their lifts. Nikita’s footwork is slow, particularly in his nondominant direction. Yet they’re trying 2 change-of-rotation lifts in the LP. Not sure this is a good strategy, as it highlights a weak area for him. P/B lost 6+ points off in negative GOE in the LP–definitely not what you want. They placed sixth. All in all, Winter Universiade wasn’t the highest-level pairs event, but I loved seeing Yu/Jin compete one last time this season (presumably). And it was also a decent finish to the season for the two Russian teams. 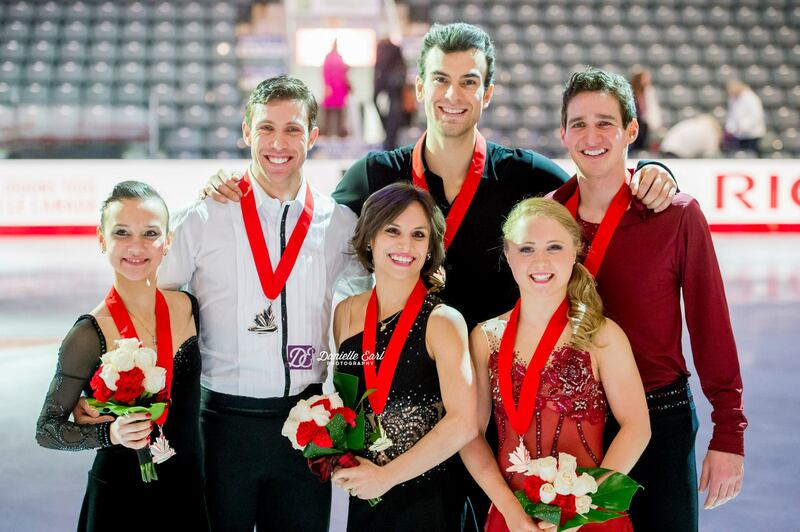 Going into Canadian Nationals, there wasn’t much doubt who would stand atop the pairs podium. 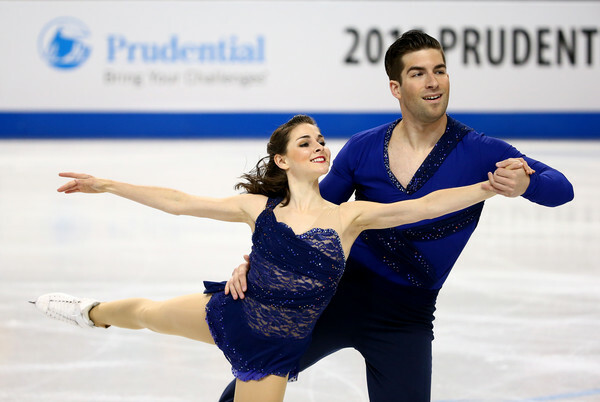 Duhamel/Radford were the odds-on favorites, following an undefeated season on the Grand Prix. And indeed, they cruised to victory. However, there was still plenty of drama, as former partners Kirsten Moore-Towers/Dylan Moscovitch and their new partners battled for the other two spots on the podium. Unfortunately, I could only find video for the top 4 pairs in the event, so can’t comment on the lower-ranked teams. Let’s see what worked well and what didn’t for the top 4 pairs. Meagan/Eric easily won their fourth national title in Kingston. Nationals was almost a formality for them this year. With longtime rivals Moore-Towers/Moscovitch having split last spring, Meagan/Eric really had no competition at this event. What needs work: Not much. D/R’s challenge for the rest of the season is simply to maintain their current condition and momentum. It was exciting to see Luba/Dylan skate at their first nationals together. Kingston is the city where Luba first caught the eye of the skating world with her electric performance at SkateCanada in 2010. Now she returned as a Canadian competitor for the first time (albeit not yet a citizen). No doubt, she and Dylan must have been feeling a lot of emotion, not to mention nerves and pressure. However, they handled it like true professionals and kept the focus on their skating. With two strong performances in Kingston, they claimed silver and a spot on the 4CC/World teams. A year ago, who could have imagined this happening? There is something a bit magical about this partnership. What went well: Chemistry, strong programs, lifts. Luba/Dylan’s programs are such an asset this season. They consciously set out to create programs that are a little bit different and showcase their own unique, developing style. And it’s really worked. The programs are so enjoyable to watch and fit them so well. There are many great moments I love—the ending pose in the SP, Luba’s cantilever into the death spiral, and especially the gorgeous spiral sequence in the middle of their LP. The programs are enhanced even more by this pair’s tremendous chemistry. I don’t know what it is about them, but I just love them together. There is a certain emotional intensity and unpredictable element to their skating that is just so exciting. They have more chemistry than any new team I can think of in recent memory. And, to turn to the technical side, they also have good lifts. Dylan, of course, was always known for his lifts with Kirsten. His skills have transferred over easily to the new partnership, and, if anything, his lifts with Luba are even better due to Luba’s impressive flexibility. Altogether they earned 4.63 points in positive GOE on their lifts in Kingston. What needs work: Jump consistency, triple twist, levels. Luba/Dylan had several jumping errors in the LP, so they’ll want to work on that. Their triple twist is also a weak point right now. It was low and crashy in the long program and got negative GOE. Tracy Wilson said on Canadian TV that this has been one of the hardest elements for them to learn as a team, so realistically, it probably won’t get much better until next year. Another thing to work on is levels. Their death spiral in the LP was beautiful but perhaps a bit slow and got only level 2. Their spins are all level 3, so they’ll want to try and get those up a level if possible. Julianne/Charlie won the bronze medal, a bit surprising considering they competed internationally this year as juniors, not seniors. They are undefeated on the junior level. They managed to just edge out Kirsten Moore-Towers/Michael Marinaro to grab bronze and the final spot on the World team. Their margin of victory was just .95 points, and I think the result could probably be argued. What went well: Consistency. Julianne/Charlie skated consistently well through both programs. There weren’t many standout moves or really exciting moments, but there weren’t any real mistakes, either. They’re using some different music for their programs (Grand Budapest Hotel and a Peter Gabriel medley), which is nice. I like the SP. Tracy Wilson commented that they had great flow through the LP. I’m not a Peter Gabriel fan, so in my case, I find this music and program a bit monotonous/dull. However, PCS is partly subjective, and they scored well in the LP. What needs work: Twist and presentation. As you would expect from a team just coming up from juniors, their triple twist is a little low and small. Currently it’s getting level 2. They’ll want to work on this element and get it stronger. I think they could also work on speed, presentation, and lift positions. They have a bit of a juniorish look; just a lack of refinement and detail. Their lift positions right now are somewhat basic. Julianne could improve her extension and toepoint, and Charlie could improve the speed a bit. Kirsten/Mike skated quite well here and just missed the bronze medal in a close decision. They’re definitely improving as a team. Fortunately, they will get an opportunity to skate at 4CCs, as Seguin/Bilodeau will be doing Junior Worlds around that time. Nice for them to be able to close out their season with a major international, if not Worlds. What went well: Jump consistency and general performance level. Kirsten/Mike landed all their jump elements in Kingston, so that was good. And I felt like their performance level and comfort with the programs is improved since their GP appearances. They skated the programs quite well, and they definitely have a more mature, senior-level look than Seguin/Bilodeau. I’m a bit surprised they didn’t get the nod over S/B, because the teams were very close and ultimately, I do prefer Kirsten/Mike’s look on the ice. I guess the judges didn’t see it that way, though. 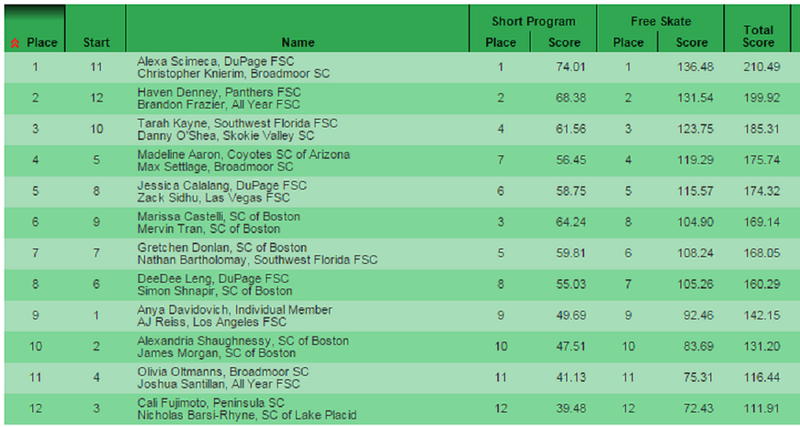 Although Kirsten/Mike won the PCS battle in the SP by 1.38 points, S/B came back to win the PCS in the LP by 1.21 pts. Interesting. What needs work: Quality of elements and lifts. MT/M are completing the elements, but not with great quality. Their levels and GOE marks are both on the low side. For example, in the short program, MT/M’s death spiral was only level 1 versus S/B’s level 4, so MT/M lost over 1 point on that element alone. They just need to keep working and improve the quality. Lifts are still also an area of concern. The lift speed looked better than in their GPs. However, Mike is still leaning forward in his carry stance. Hopefully they can correct that problem during the offseason. I think they are starting to come together as a team, though. 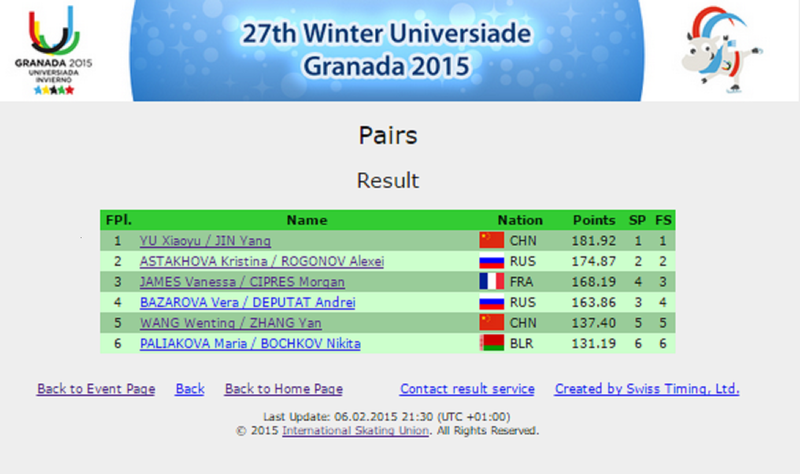 Overall, it was a good pairs event. I’m loving the top 2 teams right now and can’t wait to see them at 4CCs! And it’s great to see some depth developing in Canadian pairs. I’m sure next year’s pairs competition will be even better. First off, can’t the USFSA and SkateCanada agree to hold their Nationals on two different weekends?! Having both North American Nationals on the same weekend makes it tough on us skating fans! Inevitably, I think, we wind up focusing on our own country’s event to the neglect of the other–when really, in many cases, we’d like to watch both! (Or at least parts of both.) Also, it would be really great if there were some way SkateCanada could provide a livestream of their senior events to Americans who don’t get Canadian TV . . . But, enough complaining. 🙂 Let’s move on to the pairs action! 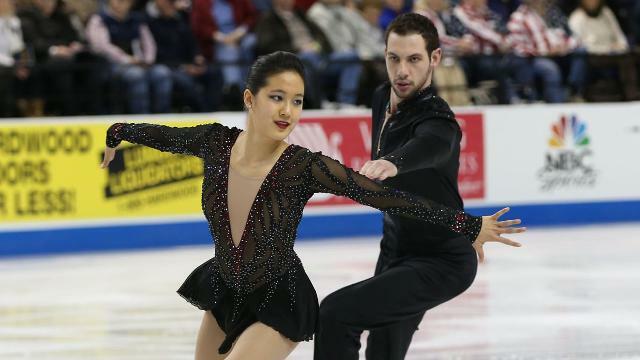 Last year’s pairs event at U.S. Nationals was one of the most exciting in recent memory. And despite all the off-season splits/new partnerships, this year’s event was almost as good. Here are my thoughts on what worked and what didn’t for the U.S. pairs. Alexa/Chris came into Nationals focused on getting the win. And they did! They placed first in both segments and won the event by 10.57 points over Denney/Frazier. Although their win was not wholly unexpected, I think the margin of victory was a surprise. It sets them up nicely for 4CCs and Worlds. What was good: The technical elements. Prior to Nationals, Alexa/Chris announced they were adding the quad twist. They hit the quad several times in practice and did so again in their LP. And not only did they land it, they got level 3 and +2.43 in GOE for a total of 10.53 points on this element. Very impressive indeed! (In contrast, D/F scored 7.30 points on their triple twist.) Alexa/Chris also hit the SBS 3S in both programs. This was a major hurdle, as they have struggled with this jump since last season. So nice to see them land it here. They did have some problems with the SBS 2A/2A and the exit on the last lift in the LP, but otherwise their technical elements were strong. In the SP, they got level 4 on every element except the twist. They also had a couple level 4s in the LP. The GOE marks were mostly positive across the board. All in all, the technical elements are starting to fall into place for Alexa/Chris. What needs work: Performance level. Alexa/Chris skated very well in Greensboro and got strong PCS scores. Yet at the same time, you could definitely sense they were a bit nervous and tight, especially in the LP, with the championship on the line. Their performance and expression is improving; however, there’s still room to grow. They are a very lovely-looking team on the ice, but they can work on selling the programs and involving the audience more. I think some of this will come naturally as their confidence continues to build. Many had picked Denney/Frazier to win Nationals. And Haven/Brandon skated two very solid programs in Greensboro. However, they had to settle for silver behind Alexa/Chris. The good news is, they made the World team. Haven/Brandon won Junior Worlds in 2013, but this will be their first appearance at senior Worlds and will be invaluable experience for them going forward. What was good: Lifts, triple twist, and transitions. D/F’s lifts are complex, with nice positions from Haven, and consistently get level 4 and good GOE. Their triple twist doesn’t have the spectacular height of Scimeca/Knierim, but it’s very nice nonetheless and is a reliably high-scoring element for them. They’ve gotten level 4 on it several times this season and almost always receive positive GOE. Aside from that, I think the refinement and detail of their transitions really stands out. Their programs are so well constructed and are a real asset for them. What needs work: Again, performance level. Haven & Brandon skated very tight at this event, which really affected their speed. As Johnny Weir said on NBC, a lot of their elements were noticeably slow and labored. Because the speed wasn’t there, they couldn’t sell the programs as well as they did earlier this season. Especially in the LP, they seemed nervous and flat emotionally. These two have all the tools; everything it takes to succeed. But they need to raise the emotional level and skate with more freedom and passion. What a comeback for Tarah/Danny. After undergoing hip labrum surgery last summer, it really seemed doubtful that this pair would be able to compete at all this season. Somehow, they not only got back into competitive shape but actually won their first national medal here and made the 4CC team. What a moment for them! What needs work: Quality of technical elements. Tarah/Danny’s base value is pretty close to the top 2 teams. However, they are not getting nearly as much positive GOE, which basically means the judges do not see the same quality in their elements. Tarah/Danny’s total GOE for the event was 10.30, which was almost 6 points off D/F’s GOE score, and over 20 points behind S/K’s. So, they need to work on those elements to get the quality up. I’d say the biggest problem area is the triple twist. In the short program, S/K and D/F scored almost 3 points higher than K/O on this element alone. K/O’s lifts are also not scoring very high. They need more height in the twist and more speed on the lifts. 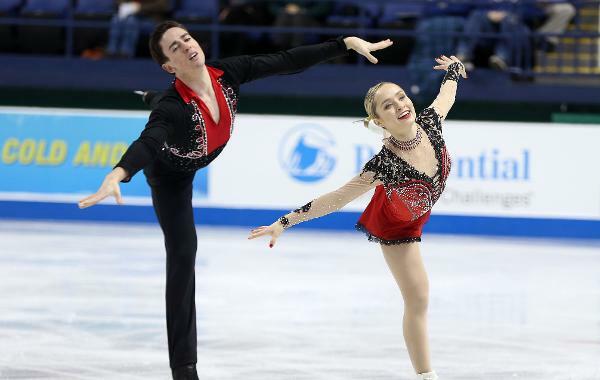 Maddie & Max had a great debut season on the GP, and some thought they might challenge for the podium in Greensboro. Any such hopes went by the wayside when Max fell in the short program. However, they pulled up in the LP to place fourth and win the pewter medal. I felt like their performances at Nationals were a bit restrained; not quite as expressive and open as on the GP. However, it was a great showing for their first senior nationals. What was good: With Maddie & Max, what stands out is their packaging. Their costumes, music, and choreography all combine to create a surprisingly polished, satisfying package for such a young team. Maddie’s carriage is lovely, and I personally find Max engaging and likable as a performer. Also, as John Coughlin mentioned on IceNetwork, their SBS spins are notable for their difficulty and beautiful positions. What needs work: Jump consistency and levels. Maddie/Max had many mistakes on jumps this season, including Max’s SBS fall in Greensboro in the SP and Maddie’s throw 3S fall in the LP. They don’t have the biggest, most impressive pairs elements and aren’t getting a lot of positive GOE yet on those elements, so they need to limit the negative GOE they’re getting on jumps. I would definitely make that a focus in the offseason. Also, they need to work toward getting higher base value levels. In both programs here, they had several level 3 elements and have received even lower levels internationally. All those level losses are .2, .4., .5 here and there, which adds up. Jessica/Zack skated pretty well at Nationals to claim 5th place. Their short program was one of their strongest SPs this season. What needs work: Skating skills and chemistry. Jessica is a lovely skater. Zack presents her nicely, but I’d like to see them interact more as a team and work on their chemistry. Perhaps better choreography would help. Also, I think they need to improve their skating skills and get into the ice more. This was the first Nationals for Marissa/Mervin. (Or Mervissa, as Jackie Wong dubbed them. :-)) Hopefully it will be one of many to come, because I feel this team has such potential! In the short program, that potential was on full display and Marissa/Mervin placed a surprising third. Their LP was not as good, and they dropped to 8th in that segment and 6th overall. However, I still feel there’s so much upside with this pair. What was good: Skating skills, skating skills, skating skills. I love watching these two move across the ice. The speed and depth of edge is marvelous. Watch their footwork into the SBS 3S in the long program—it’s so fast and sure-footed. The step sequence in the short program also really highlights their skating skills; they had level 4, many +2s, and even a +3 for this element. Also, Marissa’s throw 3S is still very big and good, just as it was with Simon. Finally, they have nice programs and packaging; very mature and sophisticated. What needs work: Pairs elements—lifts, twist, throw 3F. Marissa/Mervin’s more difficult pairs elements are still a work in progress. They did only a throw 2F in the LP; obviously, they’ll need to upgrade that. Their twist was not bad in the SP, but rather poor in the LP. Some of their lifts look very nice; other times, they’re a bit shaky. I think they just need more time together to continue to get comfortable, work hard, and improve. A couple things I’d look at here are: 1) Out of all the new teams this year, I think Marissa/Mervin have perhaps the biggest size change compared to their old partnerships, and that’s got to make it more difficult to get new timing and balance down. 2) When you look at their two previous partnerships (Castelli/Shnapir, Takahashi/Tran), neither partnership started off particularly fast. It took several years for both teams to hit their stride. So perhaps it will also take a bit of time for Mervin/Marissa to really gel. I just hope they can stay patient and keep working, because I love them together. 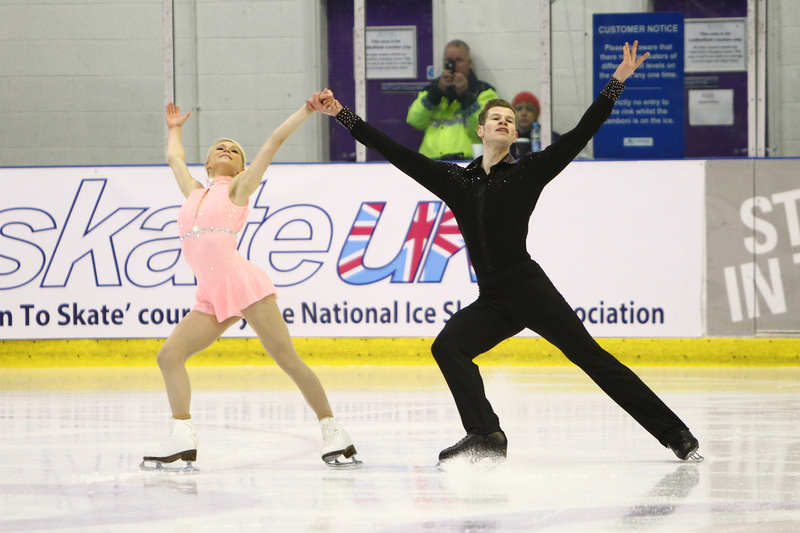 Unlike the other top pairs, Gretchen/Nate came into Nationals without having participated in any senior B or GP events. No one knew what to expect or how they would look as partners. I think they surprised most everyone with two solid programs and a surprisingly compatible, polished look for such a new team! They placed 5th in the SP and 7th overall. What went well: I was most impressed with Gretchen/Nate’s lifts and their general comfort level as a pair. Their lifts looked quite smooth; all were level 4 with good GOE. And I thought they generally just looked very comfortable together. There weren’t many of those awkward, stiff moments that often happen with new pairs. And their programs are well suited to them and showcase Gretchen’s elegance. What needs work: Jump consistency and speed. On IceNetwork, John Coughlin commented that they seemed a bit cautious and “safe” in the SP. DeeDee/Simon came into Nationals with DeeDee still recovering from an injury. They skated similarly to their GP performances this fall and placed 8th. What went well: Lifts, throw 3S, and SBS spins! DeeDee/Simon’s lifts are really good for such a new team. Simon really shines, showing a lot of strength and good footwork. He keeps the speed up nicely in the lifts. All but one of their lifts were level 4 and got positive GOE, with many +2s. The throw 3S is also really big and strong, as it was with Marissa, and scored well. Finally, DeeDee/Simon did some quite good SBS spins in Greensboro. A pleasant surprise, considering how much Marissa/Simon struggled with that element! What needs work: Presentation. As of now, DeeDee/Simon are only doing throw 2Lp and double twist. Obviously, they’ll need to upgrade those elements. But the main thing is working on basic presentation—skating skills, speed, unison, timing, pairs quality. Program selection next year will be important—I don’t think anything too soft or romantic will work for these two. I would look to Duhamel/Radford’s programs and perhaps pick music similar to that. This new pair placed 9th, but almost 20 points back from Leng/Shnapir. They are still working on just getting all the elements, although they landed a couple of good throw jumps. They had a solid, athletic look on the ice. It will be interesting to see how they develop. Alex/Jimmy made just as big a comeback this season as Kayne/O’Shea and placed 10th. They had a terrible training accident this fall that resulted in Alex breaking her jaw. She had surgery, they missed their first-ever international assignment, and then Jimmy injured his hand last week at Nationals! What bad luck they’ve had, but they still managed to put out two enjoyable performances in Greensboro. Their Grease SP was a lot of fun. And their long program to “Concerto per il tuo Ricordo” was lovely, although marred by some mistakes. This team are fan favorites. Let’s hope next year goes better for them! This pair skated some interesting programs in Greensboro to place 11th. A tall team with not much height difference between them, they had some very unusual moves in their programs and lovely, long lines. However, they struggled greatly with the lifts in the long program. They split up right after Nationals. This pair debuted in seniors this year with a 12th-place finish. They are a mirror team and have a nice look on the ice. At present, however, they lack the technical content to be competitive. Their elements are all doubles except for the throw 3S. The junior pairs competition at Nationals was also interesting. We have a couple of promising new pairs going to Junior Worlds next month. Caitlin/Ernie have only been together a few months. However, they’ve progressed so quickly that they were able to win the championship here with two very nice programs. Their Nostradamus SP was particularly impressive, skated with great attack and sharpness. The Don Quixote LP included an excellent throw 3Lp and some nice lifts. Caitlin/Ernie had by far the most polished, mature look of any of the junior teams. They skated with a lot of confidence and authority, unusual to see in such a new team. They will compete at Junior Worlds in March. This is their only season of junior eligibility, so let’s hope they have a good event! Chelsea/Brian are another new team that has come together very quickly. Their technical content is a shade more difficult than Caitlin/Ernie’s, with a triple twist, SBS 2A/2T combo, and throw 3Lp as highlights. They have very nice presentation also, although not quite the same flair as Caitlin/Ernie. They did compete internationally this season on the Junior Grand Prix and made the Junior Grand Prix Final. They have also been assigned to Junior Worlds. It was a great Nationals in Greensboro! So exciting to see the new U.S. pairs start to come together, and to see the existing pairs continue to improve and add exciting new content. U.S. pairs still have quite a ways to go before we can contend for medals at Worlds, but I do see progress and promise. Going into 4CCs, the U.S. pairs face quite a challenge. They will compete against a formidable group of pairs including Duhamel/Radford, Peng/Zhang, and Sui/Han. Then, there is the surprising return of 2010 Olympic silver medalists Pang/Tong, plus rising Canadian pairs Ilyuschechkina/Moscovitch and Seguin/Bilodeau. It should be a great competition. I’m looking forward to more quad twists, more quad throws, and lots of excitement!! Well, it was an interesting pairs event in Stockholm! Going into Europeans, I think most were expecting the Russian pairs to sweep the podium. And so they did. However, the other Euro pairs put up a stiffer challenge than expected. And things didn’t quite go according to plan for the Russian teams, either. Let’s take a look at what happened. Unexpectedly, Kavaguti/Smirnov triumphed here to win their second European title. After everything they went through last season—Smirnov’s injury, surgery, and missing the Olympics—this victory must be particularly sweet for Yuko and Sasha. “We’re just so happy,” Smirnov said afterward. They started the competition with an excellent outing of their Meditation from Thais SP. This lovely program really shows off Yuko’s delicate, floating quality on the ice. They performed it extremely well here. Their SBS 3T, often a problem element, was right on. And their triple twist was the best they’ve done all season. The catch was a bit low still, but it was smoothly completed, and they earned level 3 and mostly +2s for a total of 7.10. They’ve really struggled with their twist this season, often getting negative GOE, so it was nice to see them do it well here. They were in second place after the short. Yuko & Sasha then took command of the ice with an excellent performance of their Manfred Symphony LP. They opened the program with a great SBS 3T/3T sequence. They were quite slow going into the SBS 2A and I was afraid they might fall, but they didn’t! Next up was the throw quad salchow. And Yuko again landed it very well! So exciting to see. Russian TV showed Tamara Moskvina jumping up and down at the boards—then quickly frowning and pressing her hands down as if to say, “Calm down, you must finish the program!” And K/S did just that, with a nice set of SBS spins right after the quad. Their triple twist was completed with positive GOE, and the triple loop was solid, albeit with a slight turnout after the landing. The only real problem came at the very end. Sasha lost strength in the final lift, and Yuko came down early. That deflated the program a bit, but it was still an excellent performance. Yuko & Sasha earned 137.81 to win the title. This victory should certainly help Kavaguti/Smirnov’s momentum going into Worlds. They’ve had a very up-and-down season, but have gotten stronger over the last 2 events to once again put themselves in the conversation for a medal at Worlds. However, there is still much to work on. Their LP score, although very good, was well off Duhamel/Radford’s international season’s best mark of 146.22 at the GP Final. K/S need to continue to work on their twist, their consistency, and the quality of their elements. However, this was a great moment for the veteran team. In contrast, this competition did not go so well for Stolbova/Klimov. They came in as the heavy favorites, but in the end placed second. Their Crouching Tiger SP was well done, but not their strongest SP technically. The opening triple twist was a bit low and got only level 2. The SBS 3Ts were excellent. The throw 3Lz was a mixed bag—very fast rotation, but Ksenia two-footed the landing. Nevertheless they still got all positive GOE on it. The SBS spins were terrific. Ksenia appeared to stumble slightly as the footwork sequence started, but they gained speed and finished strongly. It was a good performance, but not their best. They placed first, with a lead of .34 TES and 1.18 PCS. Considering the quality and beauty of Kavaguti/Smirnov’s short program here, I questioned Stolbova/Klimov’s PCS lead in this segment. In the long program, I thought Ksenia & Fedor looked tight from the start. They went for all the elements but didn’t seem to skate with quite the same expression and freedom as earlier in the season. It looked a bit perfunctory. Ksenia stepped out and two-footed the landing of the throw 3Lz. They lost -1.20 GOE on that element. The SBS 3T/2T/2T combo was very well done, and I thought they might get back on track. However, the following reverse-entry lift looked a bit shaky, with Fedor struggling on the first few turns. Their SBS spins were wonderful, perfectly synchronized and very close together, and the SBS 2A was terrific as usual. Somehow, though, they still looked tight, but I did not expect what happened next: Fedor fell on footwork right at the end of the program, and they couldn’t even attempt the final throw 3S. All they could do was get into their final pose as the music ended. Afterward, Ksenia appeared furious/disgusted and poor Fedor crushed. They skated off the ice rather stunned. The scores kept them in second place but seemed too high, considering what had just happened. They received 69.35 in PCS, which was 7.5 points higher than Tarasova/Morozov, who had skated earlier and put out a nearly clean performance. This event was the third disappointing competition in a row for Stolbova/Klimov. They started the season so strongly and appeared to be the early favorites for Worlds. However, since December they have 1) lost the GP Final to Duhamel/Radford; 2) lost the LP at Russian Nationals to Tarasova/Morozov; 3) lost the LP and title here to Kavaguti/Smirnov. I have to wonder if the wide margin of the GP Final loss has rattled their confidence. Hopefully they can use this downtime before Worlds to regroup. There is still tremendous quality in all of their skating. However, they have made no base value adjustments to the programs, so it’s unclear how they can win Worlds unless D/R make mistakes. That can’t be a good feeling. Evgenia & Vladimir had a rough start in the short program here. They opened their Sarabande Suite SP with another huge level 4 triple twist. However, things went downhill on the jumps. Evgenia doubled the 3T. The throw 3Lp was big, but Evgenia two-footed the landing and put a hand down. They recovered with a beautiful lift and terrific SBS spins. However, their step sequence was only a level 2 compared to their usual level 4, which cost them roughly 2 points off their typical score. I love this program, and they showed great quality in the successful elements. However, they placed only fifth and looked a bit flattened in the kiss-n-cry. Tarasova/Morozov came back in the long program and skated very well, just as they had at Russian Nationals. Again, they started with their money element, the level 4 triple twist. They received almost all +3s on this element and it’s so good, it literally sends a chill down my spine! T/M then landed the SBS 3S and SBS 3T/2T nicely. Both throws were big. I thought Evgenia might have put a slight foot down on the throw 3Lp; but if she did, I don’t think the judges saw it, as the GOE was mostly good. The SBS spins were lovely with just a very slight synchro loss at the end. The only real problem came on the final press lift. 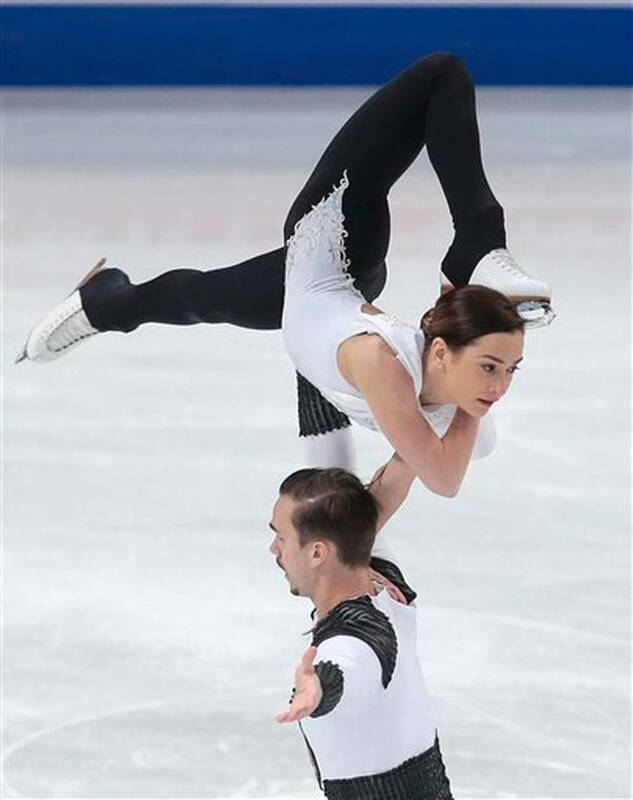 As they were transitioning from the star to upside-down hold, Vladimir lost his hand placement and Evgenia came down early. It still counted as a group 3 lift, but was only level 1, resulting in a loss of about 2 to 3 points. Despite the lift problem, I still really enjoyed their performance. Every time I see this team, I fall a little more in love with them. Their basic skating is just so wonderful. Speed, position, carriage—they have everything. Evgenia’s posture is so beautiful, and Vladimir has great turning ability and speed in the lifts. The simplicity of their LP costumes really highlights the pure, classic beauty of their skating. Only the program itself is not up to par. T/M scored 125.89 in the LP to place third. Their PCS score was 61.81—good. But I would have liked to see higher. I think skating out of the final group was not helpful to their PCS. T/M are now scheduled to compete at Winter Universiade against domestic rivals Astakhova/Rogonov and Bazarova/Larionov. To my mind, they have certainly done enough to earn a spot on the Russian World team, with bronze at Europeans and silver at Russian Nationals plus 2 GP medals. Let’s hope the RSF sees it the same way! I will be very disappointed if this team isn’t at Worlds. Marchei/Hotarek came close to winning a medal here and were easily the biggest surprise in the event. The first time I saw this new team at Warsaw Cup, I wasn’t too sure about them. Now I’m on board. They are coming together incredibly quickly and are already competitive. It’s really quite amazing considering Valentina only started pairs 5 months ago. I don’t think I’ve ever seen a new pairs lady make such rapid progress. Valentina & Ondrej skated a very strong SP. As of yet, they are only performing a double twist. However, it was well done, as were most of their elements. They received negative GOE only for the throw 3F. The highlight of their Malaguena SP , by far, is the final footwork sequence. They really shine, performing it with a ton of expression and speed. Valentina in particular really gets into the character and sells it. They received level 4 and several +2s for this step sequence and placed 4th in this segment. Marchei/Hotarek started their La Strada LP with a bang, landing SBS 3Lz as their opening element. The jumps were well synchronized and earned mostly +2s in GOE. Wow! Their other elements were strong for the most part. The only problem came on the SBS 3S/2T combo, which turned into a SBS 2S/1T. They skate with a lot of speed, really impressive for such a new team, and they have nice, clean, sharp movement on the ice. Valentina hits her lift positions amazingly quickly and cleanly for someone so new to pairs. I think the combination of Ondrej’s pairs experience and Valentina’s long experience performing and selling programs as a single lady is all combining in a very unexpected, exciting way. They scored 117.44 to place 4th in the LP and overall. In an interview with Jean-Christophe Berlot, Marchei/Hotarek said they hope to add a triple twist into their programs by Worlds. If that happens, it will be very interesting to see how they place in Shanghai. When we last saw James/Cipres at Trophee Eric Bompard, they had just gotten back to France after several months of training in Russia. Their results on the Grand Prix were disappointing. They arrived in Stockholm with a new coach, Claude Tevenard, and a new short program. Earlier this season they were skating a tango SP to La Cumparsita; now they’re using Tango de Roxanne from the Moulin Rouge soundtrack. I think this new program suits them much better. The dramatic music fits their strong, athletic style, and they skated the program with a lot more confidence and energy than they showed earlier in the season. They landed very good SBS 3Ts, with great runout, and a very high throw 3F. Their weak element was the triple twist, which had a low catch and rough landing and got mostly negative GOE. Nonetheless, they scored a season’s best 60.13, improving almost 4 points over their previous best, and placed a surprising third. They were very happy in the kiss-n-cry. Their Angels & Demons LP did not go as well. They had a lot of small technical errors. The triple twist was higher than usual but had a hitch on the landing. They hit the SBS 3T/2T/2T combo well but Vanessa doubled the SBS 3S. The death spiral and pairs combo spin were both slow; the throw 3S was landed but shaky; and, on the last lift, it took a long moment to establish Vanessa’s position and get rotation started. The biggest problem, however, was the first lift, which didn’t even get off the ground! That cost them roughly 7 points. Altogether it was another sloppy performance. Vanessa & Morgan skate with a lot of power, yet I feel like their basic skills need improvement. A lot of their elements are slow; their lifts still seem insecure; and I wish Vanessa could hold her shoulders up more and straighten her back a little—she is pitched forward a lot of the time. The audience seemed to get into the program, and they got a pretty big ovation at the end. With a score of 107.16, they dropped to 6th in the LP and 5th overall. Nicole & Matteo were 8th last year at Europeans and improved to 6th this year. They had a number of mistakes in their Cinderella SP. Nicole fell on the SBS 3S, and then they slipped out of the death spiral, which earned no points. They were quite upset afterward. Their Mask of Zorro LP went better but still had a number of jump errors. Nicole missed the second jump in the 3S combo, two-footed the throw 3Lp, and landed forward on the throw 3S. Aside from that, the program held together pretty well. The SBS 2A was good, the lifts are improving, and the SBS spin was well synchronized. The program isn’t exactly sophisticated, yet I find it goes by quickly and is pretty entertaining. They scored 107.34 here, just slightly under their season’s best at TEB. Hopefully the domestic rivalry with Marchei/Hotarek will help push this team to keep improving. Vartmann/Van Cleave placed 7th in what may have been their final competition as a team. On Sunday, the German press reported that Vartmann is ending the partnership to team up with Ruben Blommaert. It’s unclear if Vartmann/Van Cleave will compete at Worlds or not. V/V had a relatively good skate here in the SP, improving on their previous season’s best by almost 6 points. Aaron struggled with the SBS 3T, but the other elements were not bad. I actually thought they were a little lowballed in PCS! They had their usual struggles in the long program. The triple twist was not bad, with a nice catch by Aaron, but they fell on/popped the next 3 jump elements. They recovered with some good lifts and a good throw 3S. Their final score was a season’s best 100.91. It will be interesting to see how Mari does with Blommaert. I could see their skating styles perhaps meshing better than either of their current/previous teams. I also hope Aaron finds another partner if he wants to continue. This young Austrian pair had a pretty good competition here. Their Zydeko SP is a little too cutesy and juvenile for my taste. But interestingly, they went for SBS 3F as their solo jump, although Miriam singled it. It will be interesting to see if they can make this a consistent element in the future. They’re the first pair I can remember trying 3F as a SBS jump. Z/S scored 43.79 and placed 9th in this segment. Their POTO LP was really not bad. They hit some good elements, including a SBS 3T/2T/2T combo and a big throw 3S. They have a generally nice, pleasant look on the ice. I’d like to see them get down in their knees more, though, and gain power in their stroking. Right now they sort of glide atop the ice rather than getting into it. However, I definitely see some potential. What I like about this team is they seem to get along well. They’re always happy and supportive of each other in the kiss-n-cry, whether they’ve skated well or not. They scored a season’s best 93.01 to place 8th overall, up from 12th last year. This was the first time we’ve seen Caitlin in a major international event since 2011 Worlds, which was the last time she competed for the U.S. with John Coughlin. It’s been a long road to get back to this point. After a one-year partnership with Josh Reagan, Caitlin teamed up with Hamish Gaman in May 2013. This was their first big international as a team. Unfortunately, I think it left us with a lot of question marks about their future. Her partnership with Hamish is a work in progress. They’ve only competed together a few times; they’re still only doing a double twist. Physically, their body types are different, and their knee action is different. Hamish is quite a bit more “up” in his knees than Caitlin; he needs to bend a lot more and get into the ice. Not easy when you’re over 6’3”, I suppose. Their POTO short program was quite nice and included a lovely, big throw 3S. Their SBS spins were also good. Caitlin peformed the program beautifully, definitely selling it as much as possible, and the overall effect was good. They scored 49.29 to place 7th in the short. However, their Rachmaninov LP was pretty much a disaster. Hamish had a very bad, full-body-length fall on the SBS 3T/2T, and Caitlin doubled. Next, they had a problem on the death spiral and Caitlin fell in the middle of it. They singled the 2A and Caitlin two-footed the throw 3Lp. More worrying, their lifts were very shaky. Hamish looked close to losing his hold and arm lock in the first two lifts. I felt nervous watching. They were both very upset afterward in the kiss-n-cry, with Caitlin almost in tears. They fell to 14th in the LP and 9th overall. Not sure what the future will hold for this pair. All in all, it was a pretty interesting pairs event, and it certainly had a lot of drama! The Russian pairs are obviously the class of the field, but it’s fun to see Marchei/Hotarek and some of the other European pairs challenge them. I’m going to be really interested to see which European pairs progress and start to get to a new level over the next year. Until then, let’s hope they can all rest and recoup over the next 7 weeks until Worlds in Shanghai!